This is the fourth in a series of four stories from a 2002 drive up the Alaskan Highway. See Gay Bashed, part 3 for the story leading to this one. I was not sure how to return from Alaska. I did want to see the Alaskan Highway headed south. I also wanted to experience the Alaskan Marine Highway, the ferry system that runs through the touted Inside Passage. There was no way to avoid Watson Lake if I were to drive back, so the handsome lumberjack’s “and don’t come back” seemed the perfect invitation to enjoy the ferry ride instead. A comfortable lounge on the ship provided pleasant conversation. The second evening I enjoyed a chat with a fit, intense guy with the vocabulary and calm demeanor of an engineer. He’d been alone in Alaska for six years and was escaping, to use his word, to Hawaii. I bought him a beer. We were staying in different classes of cabins and, wanting to check out the ship, I picked up some beers from my stash and met him in his roomette. 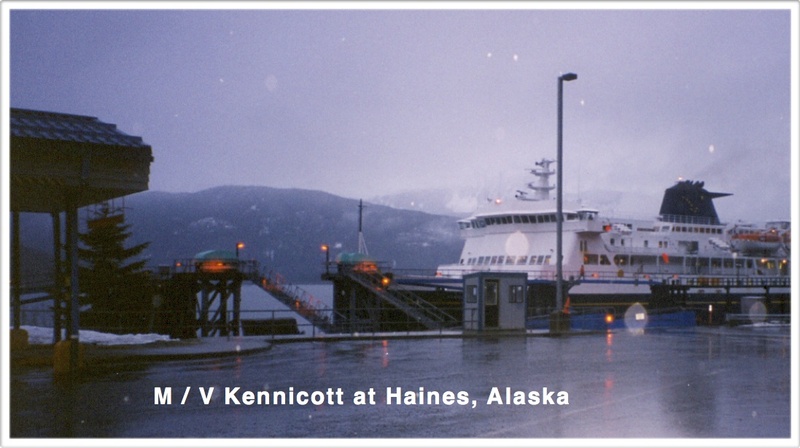 How to describe the smallest cabin available on the M / V Kennicott? The aisle between the door and the two bunk beds is perhaps two feet across. The top bunk is about a yard above the bottom bed. A small porthole looks across the deck to barrels of inflatable life rafts. And that’s it. It’s economical and it beats pitching a tent on the deck. We were both tall men so relaxing for conversation was a rather gangly affair, our necks bent to fit under the top bunk, our bodies curved so our butts would still be on the bottom bunk, our legs sprawled and tucked about the narrow aisle. We chatted about Alaska. We chatted about the ship. We chatted about his living in the North. We chatted about my trip. And now, I decided, was the time to reveal my intentions. I had the perfect introduction—I had a story. I told a quick story of growing up gay in the 50s. Of being turned on to men so early I held it inside. Of being fearful and digging a coward’s hole ever deeper, ever more fearful. A story of hitch hiking around the country and traveling alone. And a story of my final confrontation with the most awful fear of all—the story of being bashed for being queer. “And where was I finally bashed?” I concluded. “Not only was it in a bar parking lot (it had to be in a bar parking lot! It would not have been the all-American story any other way) — no, it was not only in a bar parking lot, but it was in a frozen bar parking lot in the Yukon! “THE YUKON ! ! ! I paused for a bit of dramatic effect. He was a young man having lived the Arctic adventure for six years. He understood my enthusiasm. Within ten minutes my awkward posture under his upper bunk had changed to a much more comfortable position on my knees—the position I had learned from the neighborhood boy so many years before. The handsome shipboard buddy seemed most welcome to be back to the services of civilization. During our conversation my shipboard buddy mentioned wondering what the staterooms on the ship were like. The next day I pestered the purser to upgrade my crowded room with a washbasin to one of the ship’s staterooms. The private bath, double bed with headroom, and cabin with a couch and big square window sure was nice. That night the black shapes of the Canadian coastal mountains were slipping by as a full moon reflected on the smooth sea. There was plenty of room for my buddy to stand while I sat on the couch. The large window let in plenty of moon shine. Soft and yellow, the moonlight set the beautiful smooth skin of his lower stomach in a warm, golden flush. This entry was posted in Alaskan Adventure and tagged gay bashing, Inside Passage, moonlight, romance, shipboard, stateroom on August 7, 2013 by deansgreatwahoo.